Dry rot, also known as brown rot, is wood decay caused by fungi, which can ruin any wooden structures inside or outside your home. When dry rot occurs, the fungi break down cellulose and hemicellulose, the components which give the wood strength and resilience. The wood is left weakened and brittle, often with a blocky appearance. Dry rot will only affect timber that is damp, typically with a moisture content in excess of 20 percent. For this reason, removing the source of moisture should form the core of any dry rot eradication strategy. Read below for more tips to prevent dry rot. The wood was not properly kiln-dried before being used in construction, to lower its moisture content below 20 percent. The location of the wood is an area of the home with excessive humidity. There has been direct contact with large quantities of water, for example, flooding from a burst pipe. In order to grow, the spores need not only moisture, but also a food source (wood), oxygen, and preferably warm temperatures (between 71 and 77 degrees Fahrenheit is ideal). 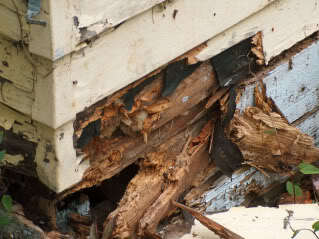 If not stopped, dry rot will weaken the wood to a point that it could literally disintegrate. Inspect the wood. Initially the fungus looks like cotton wool and may have surface water droplets if the surroundings are very humid. Check for sunken or shrunken wood. Epoxy treatments. Fill in channels within the damaged wooden structure with an epoxy treatment. This will not only kill the rot, but also strengthen the wood's structure. Commercial antifreeze. Treat dry rot with antifreeze to kill the fungus and prevent further growth of dry rot. Siding - Have wood siding sealed properly and installed by a skilled siding installer. Painting - Make sure any wood for outdoor use is primed on all 6 sides before painting. Roofing - Have your roof checked once a year to identify and prevent and potential water damage, mold, or dry rot. Install gutters to direct rainwater away from your home's walls and foundation. Plumbing - Dry rot is commonly caused by plumbing leaks. Check underneath vanities and cabinets and around toilets for leaks. If you find any, have them repaired ASAP. Ventilation - Make sure your bathrooms, attic, and kitchen have proper ventilation installed to remove excess moisture from the air. Deck - Have your deck properly sealed. If you hire a carpenter to install a new deck, have it built at a slight slope so water will shed easily. Landscaping - Position lawn sprinklers so that they do not spray onto your home's exterior trim.